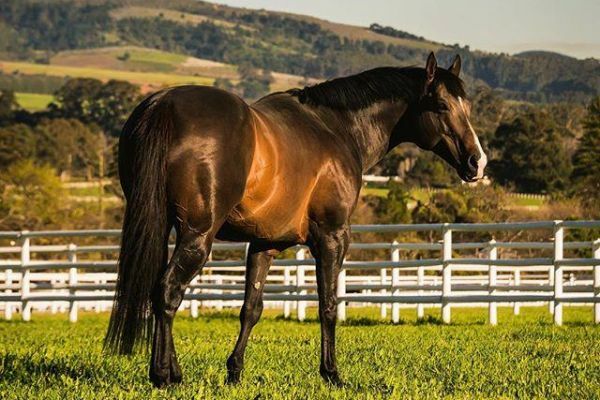 Drakenstein Stud’s inform sire What A Winter, who had a good double on Saturday last week, made headlines at Greyville on Wednesday. The triple Equus Champion was responsible for three winners on the eight race card, with What A Winter progeny winning races four, six and seven respectively. Remarkably, the Equus Champion was represented by only four runners on the day! All the rage for a maiden plate over 2000m, the Duncan Howells trained Jet Stream was the first of his sire’s runners to win on Wednesday. Ridden by Mark Khan, the 3yo colt stormed home to shed his maiden by two and a half lengths. It was another 10.75 lengths back to the third place finisher! Bred by the Hemel ‘N Aarde Stud, Jet Stream has now won or placed in three of his four outings and appeared to relish the step up in trip of Wednesday’s race. Jet Stream, who is out of the Jet Master mare Sparkling Jet, was a R280 000 buy from the 2017 National Yearling Sale. What A Winter’s second winner on Wednesday came in the form of his Daytona Stud bred and owned daughter Royal Frost. Trained by Dean Kannemeyer, the 4yo filly, last at one stage, bounded clear to land a pinnacle stakes over 1400m, with Royal Frost finishing a length clear of last season’s G2 Daisy Fillies Guineas winner Fiorella. Royal Frost, who is out of the Elliodor mare Princess Elli, has now won two of her last three outings. In total, Royal Frost, a 3 time winner, has now won or placed in 12 of 16 outings. The third and final winner of the What A Winter sired trio came when his daughter Fancifilly won Greyville’s seventh race, for trainer Louis Goosen and jockey Anton Marcus. The 4yo Fancifilly prevailed in a ding-dong finish to a fillies and mares handicap over 1000m, picking up her second career win (from six starts) in the process. Bred by the Normand Stud, Fancifilly was a R650 000 buy from the 2016 Cape Premier Yearling Sale. South Africa’s Champion First Crop Sire in 2016-2017, the four time G1 winning What A Winter is handsomely represented in two graded features at Kenilworth on Saturday. His once beaten G3 Cape Of Good Hope Nursery winner Clouds Unfold is one of two What A Winter fillies in Saturday’s G2 Western Cape Fillies Championship (Celestial Storm being the other), while What A Winter sons Fabian and Sacred Arrow both contest the G3 Cape Classic on the same day.